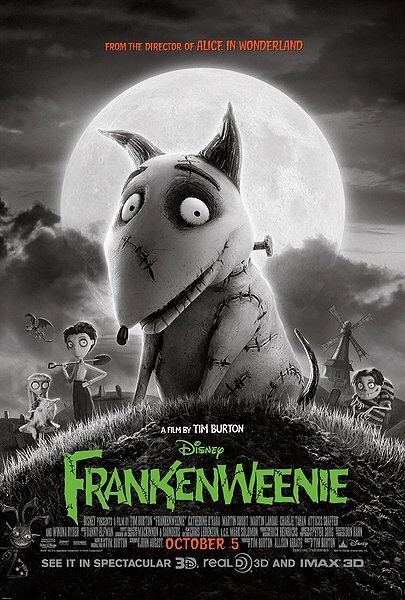 Frankenweenie is a fun and beautiful homage to classic monster movies like Frankenstein but more aimed for kids. This film proves that Tim Burton can still make great films like ‘A Nightmare Before Christmas’ and ‘Beetle Juice’. The story is clever and unique but can easily connect to its audience with an understanding of dealing with loss. The characters where weird and crazy as with most Burton creations and he clearly had a lot of fun mixing in all of those stereotypical monster movie themes and he is probably the best person to do it, Dr Frankenstein and Igor being the most prominent . It takes some confidence to make a kids film in black and white and although it may have cost them some box office money I think it really works to honour the sources it’s based off. 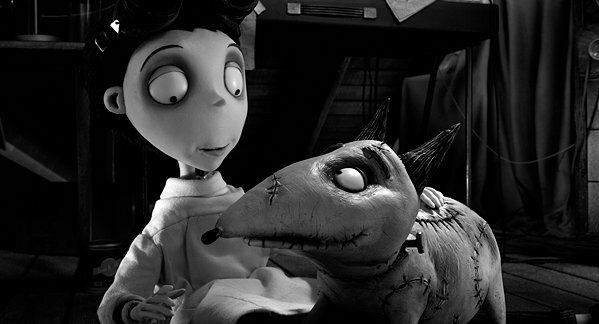 From creative genius Tim Burton comes Frankenweenie, a heartwarming tale about a boy and his dog. After unexpectedly losing his beloved dog Sparky, young Victor harnesses the power of science to bring his best friend back to life-with just a few minor adjustments. He tries to hide his home-sewn creation, but when Sparky gets out, Victor’s fellow students, teachers and the entire town all learn that getting a new “leash on life” can be monstrous. A stop-motion animated film, Frankenweenie will be filmed in black and white and rendered in 3D, which will elevate the classic style to a whole new experience. The story is so out of Burton’s mind, clearly better than anything else he has done in a while and it pays off for viewing pleasure. To me the story of a boy losing his dog and his decision to break the boundaries of life and death to bring him back is beautiful and works brilliantly with the Frankenstein theme of the film. Granted I get why it might not be as popular as other kid’s films but it’s smarter and with the stop motion you can really feel the passion put into the characters. The Acting is pretty good and I found a lot of the characters either very funny or touching which is really necessary in a film of this kind. On a side note I am just kind of happy to see a Burton film without Depp. The dialogue is easily one of the films strengths with great lines that I can easily recall and loved hearing for the first time, the mum and dad consoling their son, school friends scheming to win a science fair, but mainly the great references to the original monster films. The characters where just as strong with a brilliant ensemble of unique and creepy characters that made Burton famous, personally I think it’s his greatest gift as a film maker. My favourite character who I thought should have been used more was the science teacher Mr. Rzykruski who delivers gold in every scene he is in. I really love science but hated it most of the time in school, it was just prep for tests rather than teaching and expanding minds, probably why I loved these parts of the film. I respect Burton for using black and white in his animated film, in terms visuals there isn’t much more you could do to bring those original monsters films back than making it black and white and for me it was a really good way of getting that feel of creepy un-dead colours. The stop motion was good as well and really helped to display the different characters and their behaviours. I do like it when Burton gets his hand on stop motion because his theme is very unique and just so weird, suits the story I suppose. Something I didn’t expect from this was a sense of thrill and scares but the finale certainly did that more than I expected but I probably should have known from what happened in ‘A Nightmare Before Christmas’ that Burton can turn up the scares if he needs to for the story and for me it worked. Granted this may be a bit much for some light hearted kids out there but not my cousins. The sound on this film is also good, sadly no musical scenes but never the less a good showing from Burtons music team, you just know he has team of them. Not my favorite animated-horror film of 2012 as I liked ParaNorman more, but this was a pleasant animated diversion. 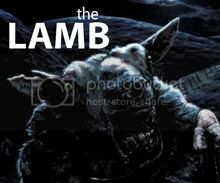 One of the best things Tim Burton has done in a while. Nice review! My favorite scene was Rzykruski’s speech, too. LOL Cracked me up!! Yeah I think he needed something he could really connect to like the monster classics. Awesome review! I liked it, but I had some issues with the story and the characters. It was still enjoyable though 🙂 I’ll watch anything with a dog in it haha. I’ll rent this as soon as it comes out. The story sounds heartwarming and the stop-motion animation is quite endearing. I really like Corpse Bride so I reckon this should be fun too. I’ve always liked Tim Burton and considering that he hasn’t really done anything really great for a long time it was good to see that he can still make good films. I loved it! Need to see this, glad you gave it a good review to keep my interest for this going. Paranorman had more heart as well. This was just okay. Not a disaster like Dark Shadows or whatever that remake was. Really enjoyed this, definitely my favourite animated film of last year. Nice review man. Nice review. I absolutely loved Frankenweenie. One of the bigger surprises of 2012 for me. I haven’t seem this, but like you said, I would be looking forward to seeing Burton without Depp as well. I find that connection played out. I’m glad to hear you liked this, I’m looking forward to seeing it. Not a perfect welcome-back gift from Burton, but still a relatively pleasant and enjoyable one to see and have fun with. Good review Tim.